Many of us dream of owning a private island, but unfortunately only the Johnny Depps and Richard Bransons of the world will ever get to know what that's like. Island ownership may very well be in your future if you can cobble together a few hundred thousand bucks and can settle for the much-cooler-than-the-Carribbean climate of Scotland. 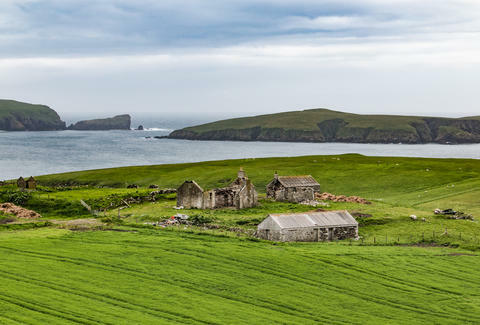 That's because there's a stunningly pristine 64-acre private island retreat off the Shetland coast on the market for just $350,000. The lush little island -- featured in the video above -- is known as Linga, and it's located in the Vaila Sound off the west coast of Shetland (an archipelago about 70 miles northeast of mainland Great Britain). It's also been uninhabited since 1934, so no need to worry that you'll be inheriting some polluted garbage dump. In terms of seclusion, it's quiet but not too quiet -- you're still close enough to the Shetland village of Walls (population 978) that a quick boat ride is all it takes to stock up on groceries or whatever else you might need in a pinch. Although it's a relative bargain ($350K is a fraction of the price of the average apartment in many cities, after all), ownership does come with some fine print. For example, due to strict development rules in Scotland, you'd be prohibited from building up the island much beyond what's already there. In this case, that means you're mostly limited to renovating the existing buildings on the property (two delapidated cottages). However the previous owners have secured "consent" to add a bit more infrastructure including a pier, storage shed, reception area, new "agricultural buildings," and an additional cottage. In terms of power, you have permission to add eco-friendly methods including solar panels and a windmill. While it's undeniably beautiful, it's far from tropical, and not exactly the sort of sandy beached paradise you might associate with island living. Still, it's verdant, serene, and filled with wildlife -- the perfect place to live out your farm life fantasy. In terms of climate, you're looking at average temps in the high 30s during the winter, and a fairly cool summer (the average temp in August is barely 55 degrees). The village of Walls is also only about 18 miles from the airport in Shetland's capital, where flights to and from Glasgow are easy to come by. New weekend plans: convince a few friends to pool their funds and set up your very own escape in the Northern Atlantic.